Verruckt! Tear down that crazy ride…Tear it down now! I would think Verruckt is kaput, and the KCK Schlitterbahn could be shot. It will be interesting to see how many people show up when the water park reopens Wednesday, minus the 168-foot-tall Verruckt water slide, which will remain closed for at least the rest of the season. It’s possible that media members will outnumber paying guests. After Sunday’s unspeakable accident, with 10-year-old Caleb Schwab dying after apparently being thrown from the three-person raft he was riding in and then hitting protective netting full force — probably head first — it’ll be a wonder to me if anyone ever again pays to walk through the gates. But then, I’m the same blogger who thought General Motors could be facing an operational crossroads after it came to light in 2014 that for a decade the carmaker had covered up a problem with ignition switches in Chevrolet Cobalts and Saturn Ions. At first, GM claimed the ignition-switch failures — and resulting deactivation of airbags — had killed 13 people. But attorney Kenneth Feinberg, who specializes in corporate payouts, later linked 124 deaths and 275 injuries to the debacle. And yet, amid that terrible publicity and the exposure of a GM as a lying enterprise, the sale of its vehicles actually rose several percentage points in 2014. The public is funny in an unpredictable sort of way…I mean, who would have thought that a major political party’s nominee for president would suggest, seriously, that gun-rights advocates might do something crazy if Hillary Clinton got elected and started appointing liberal Supreme Court justices? Yes, the public is really funny. But tonight The Star has an investigative story that should hasten the demise of the Verruckt ride. 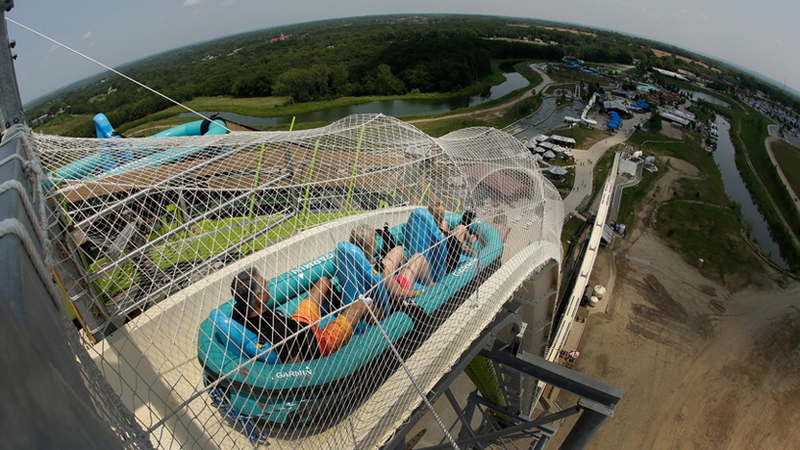 KC Star reporters Laura Bauer, Steve Vockrodt and Eric Adler spoke with several people who experienced harrowing rides on Verruckt, either because their Velcro-style shoulder harnesses came undone during the ride or their raft lifted out of the water channel. The reporters cited the case of Paul Oberhauser of Omaha who, on a trip to Schlitterbahn last month, had his shoulder strap come loose at the bottom of the first of Verruckt’s two big hills. Oberhauser’s wife Erin told The Star that for the rest of the ride her husband held on for dear life by his legs. I have never liked heights, and I have never liked roller coasters, although I’ve been goaded into riding a few. I remember one in particular at Disneyland or Walt Disney World — an outer-space-type attraction that coursed through a darkened cavern. That was easier for me to tolerate because I couldn’t see the terror before my eyes. Suffice it to say, I would not have been tempted to go on Verruckt. But our son Charlie, now approaching 27, probably would have been tugging at me to let him go on it, had it been around when he was a kid. Scary thought. I learned today that the German word verruckt means “mad,” “crazy” or “insane.” To me, it will be downright crazy if Schlitterbahn doesn’t start tearing down the Verruckt ride tomorrow. It would be something positive for the handful of Schlitterbahn’s paying customers to witness. Thanks for demanding the Verruckt be torn down NOW! When that slide was first announced, you knew it was a horrible accident waiting to happen. And tragically, it did. I’ve got to give credit to my 28-year-old daughter Brooks. As I was putting the finishing touches on the post late last night, she sat down next to me, asked me what I was writing about and then wanted to talk about it. After a few minutes, she said, “Tear it down.” In my draft, I had stopped short of that, saying it should not operate again. But her words were like an arrow in the bull’s eye, and 10 minutes later I hit the “publish” button, with Brooks’ words echoing in my head. That’s the story that went up online last night and served as the initial inspiration for this post. Great story by The Star. Fitz, Judy Thomas was not involved with the story, Laura Bauer was. Steve, Eric and laura. Thanks, John. I will correct…Sorry, Laura. Amen, Fitz. The local media (STAR, TV, radio–everyone but Tony) are refusing to report the details, claiming “respect for the family”. But in truth, Schlitterbahn is a big advertiser, so they are reluctant to throw a good client under the bus. That’s been standard practice going back to Jim Hale and Miller Nichols coverup of crime on the Plaza in the 70’s. The details of the horrible decapitation, with the head stuck in the net, the ban on helicopters who would have captured and documented news footage of the net being cut down, as reported by first responders who then were threatened with losing their jobs if they talked, WILL come out. One does not wait years for a trial before journalists need to report the details. And this was all preventable! But where was the STAR before the poor child died? No reporting on the lack of inspections? It’s a brave new world, and the public is essentially on its own. As it turns out, the STAR is VERY fortunate to have hired Steve Vockrodt from the ailing Pitch, (which owes the STAR money.) At first, he was assigned lame duties on the business desk, editing press releases. But Vockrodt is a first class investigative reporter. And his talents are far better used there, not just on the business desk but general breaking news as well. Remember the Hyatt! It’s been a long time since the STAR actually reported and had an investigative team. As you know, Tracy, I’ve heralded Vockrodt since his arrival a couple of months ago. They should have hired him a year ago, when they first entertained the notion. On one hand, it would have been unbelievably prescient for The Star, or any newspaper for that matter, to look at a ride like that, while it was going up, and say, “We should launch a full-scale investigation into the safety of this ride.” That would have been expensive — perhaps involving the hiring of engineers and physicists — and it would have amounted to trying to predict the future. On the other hand, there’s Laura Hockaday saying, “When the slide was first announced, you knew it was a horrible accident waiting to happen.” Certainly she wasn’t the only person who looked at that and saw the potential for tragedy. I was impressed with the caliber of the experts The Star contacted on this story. With their comments and assessments, what happened became horrifyingly clear. Finally, someone in the local press also used the word “decapitated”, perhaps after local blogger Tony Botello made an issue of it by providing links to articles in the foreign press that accurately described Caleb’s injury’s instead of the Schlitterbahn’s preferred description of a “neck injury”. One can understand the park’s calloused haste in getting the park open again given that the lawsuit(s) that are sure to come from this are going to have a price tag that just might close the park completely. As for the sly reference to Trump’s remarks, no one on Facebook was more offended by them than the law-abiding members of the NRA and other 2nd Amendment advocates. And since were back to talking about audiences at those events, you might point out that the Orlando shooter’s pro-Taliban father was an invited guest to Hillary’s speech, sitting behind her the entire time. With the “sly” reference to Trump’s latest foot-in-mouth, I was just killing two birds with one stone, John. I cannot get worked up about The Star’s delay in using the “d” word. It’s a lot easier for “the foreign press” or a paper on the east or west coast to introduce that about an incident here than it is for the hometown paper, which is trying mightily to respect the family. Yes, facts are facts, but in this case I think The Star did the right thing by letting other outlets introduce the gruesome truth and then just drop it in today’s story as an established fact. No harm whatsoever journalistically — dead is dead — and very respectful of the Schwab family, which is going through unimaginable hell. I’ll buy that. Knowing the family, I’m torn when I read Tracy’s description of the boy’s head stuck in the net while his body floated in the pool below. One aspect of the suit(s) is going to be the psychological damage to anyone who witnessed that scene and came away scarred from it. And thanks to your sly reference, I was able to insert yet another balancing comment about Hillary’s audience, a victory for us both, my friend. I know and like Scott Schwab, as well. I feel their pain. But reporting and hastening the investigation is not increasing their unbelievable pain. John, you know as well as I that if this happened at a NON-advertiser venue, eg the Edge of Hell or The Beast haunted houses, every detail would be reported. And of course, Precious Doe’s beheading ten years ago was completely reported. So it HAS to be the advertising!!! Follow the money. Schlitterbahn is offering free counseling for the PTSD effect. The fact is, in Kansas, damages for personal injury or wrongful death are capped at $300,000. Versus about $2.5 million in Missouri. Now that we know about repeated velcro strap failures, there is no question the innocent child was not at fault in ANY way. And with an un-tracked raft (unlike a roller-coaster car) that had a proven history and tendency to go airborne, why was the lightest person seated in the front rather than the middle or the BACK? It doesn’t take a genius to figure out how to do load distribution. This Fox4 story about the injuries suffered by the two women in the raft with Caleb leads me to believe the raft went airborne, that the occupants made contact with the netting and then the raft probably dropped back into the channel and proceeded down into the receiving pool. P.S. Can you imagine the horror (at what they saw with Caleb) those women and the rescue workers experienced??? I have lost enough sleep the past few nights thinking about this horrible tragedy to where I really don’t need, nor care, to know the explicit details of this boy’s death. What I do want to know is why the hell did this happen. And if Schlitterbahn was negligent, then they need to be sued for every penny they have _ and closed down too. Also, I wish that people would rethink their obsession with thrill-seeking. Schlitterbahn built this death trap for the sole purpose of feeding our desire to seek thrills. Now a 10-year-old boy is dead, a family has lost a child, and the lives of those who witnessed the tragedy are shattered. You’re a very caring person, Mike…Also, great point on the need to rein in the thrill-seeking gene. I think you’ll get your wish to see Schlitterbahn sued to oblivion, Mike, but in the meantime, the park was crowded today and I’m sure they’ll bleed it for every dime they can make and then transfer the profits out to another corporation before any lawsuit can reach them, leaving the victims with the park’s bankrupt carcass. What will also put them out of business will be the increased insurance rates, if they can get insurance. Neither Schlitterbahn, nor NASCAR (nor for that matter RED Development) have been good corporate neighbors. Clueless parents brought their kids to Schlitterbahn today and brushed it off as we are sorry a kid was injured but oh well. Of course that’s because they don’t know the facts. And they are letting their kids (who cannot even read) decide what to do the day before they go back to school. One Mom even joked, “Well we wouldn’t have gone on THAT ride because we’re not “verruchit”–insane!” She sure drank the Koolaid. Teen staffers who are untrained and undermotivated misloaded that car and failed to report prior belt failures. This horror show was inevitable. Just like the Hyatt. I wonder how many soccer moms would have brought their kids today to the park if the new sign said: Michael Vick Pit Bull Park. Small kids in the front row. The only place I’ve read these explicit descriptions is here, and I wish I hadn’t. It absolutely makes me cringe, and I question the necessity. Someone said, who thought it was a good idea to put a “terrifying,” gravity-defying ride like this in a family amusement park. Indeed. Gayle, to me the necessity is to have an INFORMED public. Let the buyer beware. Let the parent (or the family of the two women including the one with the broken jaw) know the facts. This park is irresponsible. Period. I agree with your second graph. America is like Rome, and Schlitterbahn is the latest coliseum. It’s an addiction to SPECTACLE. Is it not enough to know he DIED without knowing the gory details? I got incensed at KSHB tonight for skulking around the town where the two ladies (who had requested anonymity for now) live, dropping little hints about them and where they were, trying to get another angle on the story. No, Gayle, it’s not enough. Parents and kids are naive, not understanding the consequences. They’re still taking their kids to a place operated by fools. I just posted a piece about this on http://www.kcmopost.com. I agree with Tracy, Gayle. While I think The Star did the right thing by not rushing forward with the gory details, it needed to be reported. As Tracy suggests, the extent of injury reflects either the degree of the mechanical failures or the degree of human error involved, or both. While it’s difficult to take in, it’s very relevant…It’s also adds an additional element of shock that Schlitterbahn was “bustling’ — as The Star put it — when it reopened today. Thanks, Fitz. It’s always awkward to go out on a limb when feelings are so raw. You led with this topic. Good for you. Hope you enjoy my little photo essay I just posted on http://www.kcmopost.com. Trying to educate, and make a difference.